STEM education is certainly a hot topic these days, and high school sailing is where STEM meets the sea. 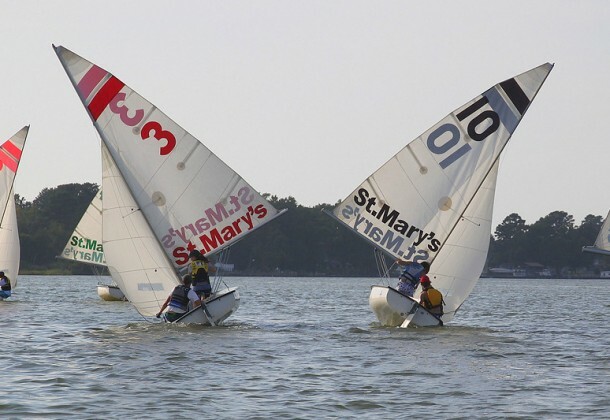 The scholastic sailing program at the Sailing Center Chesapeake gives students a unique athletic opportunity to combine scientific study with lively competition on the beautiful waters of Southern Maryland. Practices begin and end with instruction and review of meteorology, aerodynamics, and vector analysis, and student sailors must continually apply what they have learned about winds, tides, and boat trim as they race their way around set courses. “You have to think about where everybody is AND where everybody is GOING to be—it’s like chess on the water,” said Esperanza seventh-grader Dan Unangst, who has been practicing with the Leonardtown and Great Mills high school teams at SCC for 3 seasons. SCC has seen recent graduates go on to sail for West Point, the Coast Guard Academy, Saint Mary’s College, North Carolina State University, the University of Rhode Island, Eckerd College, Virginia Tech, Old Dominion University, and the University of Oklahoma, to name a few. If you’d like to get your students involved in some hands-on STEM education, or if you’d like to come out and support the next generation of great Chesapeake Bay sailors, visit sailingcenterchesapeake.org.